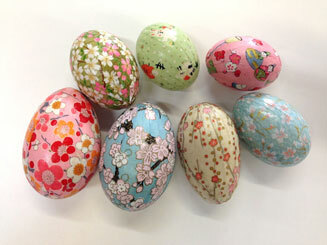 Create 3 decorative eggs with many beautiful papers to choose from! Eggs are often shared among friends and are symbols of new beginnings, so bring a friend or family member. These eggs are perfect as unique and special holiday ornaments. Taught by Barbra Friedman who introduced Martha Stewart to this craft in 2001, while owner of Bennett Valley Farm, a producer of dried wreaths and floral arrangements. These decorative eggs are super easy to make and will delight your family and friends season after season. Class fee includes all materials needed to make 3 eggs! Children of 8 and beyond are welcome!